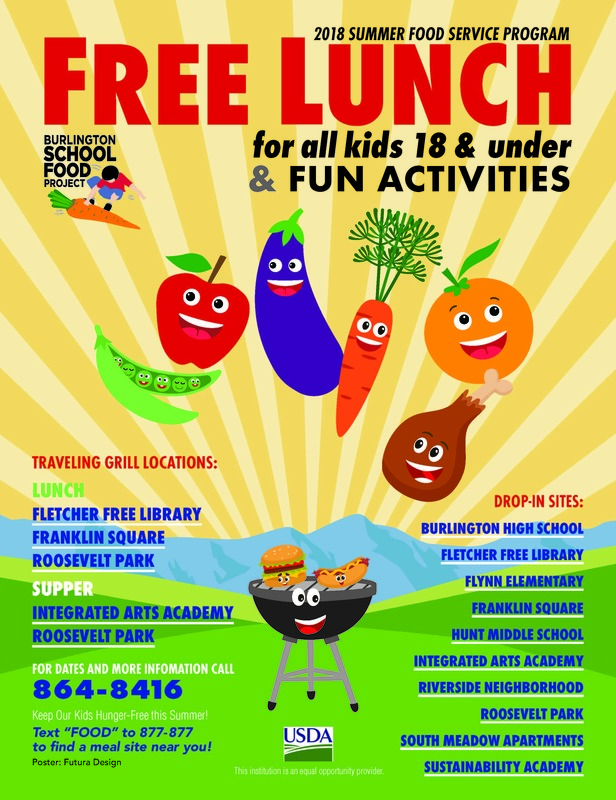 Beginning Monday, June 25th, lunch will be provided at no charge any child age 18 and under at a variety of Burlington Schools and other locations around the city. No fees. No registration. Just show up! Lunches are provided via the Burlington School Food Project, a program of the Burlington School District. Any child can come to any of the following participating sites, regardless of what town, or state, they live in. Call 2-1-1 for information on free summer lunches for kids across Vermont. Text mealsVT to 8770877 for information on lunch sites nearest you. (AD-3027), found online at http://www.ascr.usda.gov/complaint_filing_cust.html and at any USDA office, or write a letter addressed to USDA and provide in the letter all of the information requested in the form. To request a copy of the complaint form, call (866)632-9992.